Record profitability among cow-calf producers in 2014, coupled with improving forage conditions, encouraged the nation’s beef cow operations to start increasing the size of their beef cow herds. But data from the Kansas Farm Management Association indicates that, after setting a record in 2014, profitability declined sharply for cow-calf operations in 2015 and many average cost operations actually struggled to cover their variable production costs in 2016 and 2017. The result was relatively rapid inventory growth in 2015 followed by a slowdown, especially in 2017, as producers responded to the decline in profitability. NASS estimated the 2017 calf crop at 35.8 million head, an increase of 2% (716,000 head) compared to 2016. This was the third consecutive calf crop increase and the calf crop increases are fueling increases in cattle slaughter. Commercial cattle slaughter during 2017 totaled 32.2 million head, an increase of just over 5% compared to a year earlier. Compared to 2015, when cattle slaughter bottomed out at 28.8 million head, 2017’s slaughter volume was 12% larger. Beef production during 2017 did not increase rapidly as cattle slaughter since cattle dressed weights averaged 1.4% below a year earlier. As a result, beef production during 2017 rose 4% compared to 2016. Increases in the supply of beef facing U.S. consumers in 2018 will be compounded by rising supplies of competing meats. Per capita supplies of red meat and poultry provided to U.S. consumers bottomed out in 2014 at 202 pounds and have been increasing steadily since then. In 2017 per capita red meat and poultry supplies reached 217 pounds and are forecast to fall in the 221 to 223 pound range during 2018. If domestic meat supplies reach the upper end of that range, it will set a new record for meat supplies in the U.S. The surprisingly quick rebound in meat supplies over the last four years could pressure retail meat prices and, in turn, prices received by producers. Supplies of meat facing U.S. consumers are dependent not only on U.S. production levels, but also on movement of meat products through export channels since U.S. supply estimates are net of all imports and exports. Export demand for U.S. red meat and poultry has been improving pretty steadily over a long period of time. For example, during 2017 net exports (exports minus imports) of red meat and poultry were nearly 12% of U.S. meat production and are expected to equal or exceed that level in 2018. To put that in perspective, in the early part of this century meat exports were ranging between just 4 and 7% of U.S. production. Where beef and cattle prices wind up in 2018 will depend in part on the strength of both domestic and export demand. Domestic beef demand showed signs of strengthening in 2017’s third quarter, which is the most recent data available. Strong growth in the U.S. economy, resulting in improving consumer disposable incomes, bodes well for meat demand in general and beef in particular. Looking at the meat supplies facing U.S. consumers, odds would favor somewhat weaker prices for beef and cattle in 2018 than observed in 2017. Additional strength in domestic beef demand as a result of a strong U.S. economy could soften the impact of rising supplies, but probably not eliminate it. Prices for slaughter steers in the Southern Plains averaged near $121 per cwt. (live weight) in 2017. Rising slaughter cattle supplies and the resulting increase in beef supplies facing U.S. consumers in 2018 are expected to push prices lower in 2018, with the annual average price ranging from about $115 on the low end to about $120 on the high end. For prices to reach the high end of the range, domestic and export demand would both have to be very strong. Prices for steer calves in the Eastern Corn Belt could also average below 2017s annual average, but the decline in the annual average could be mitigated by the fact prices were so weak in early 2017. 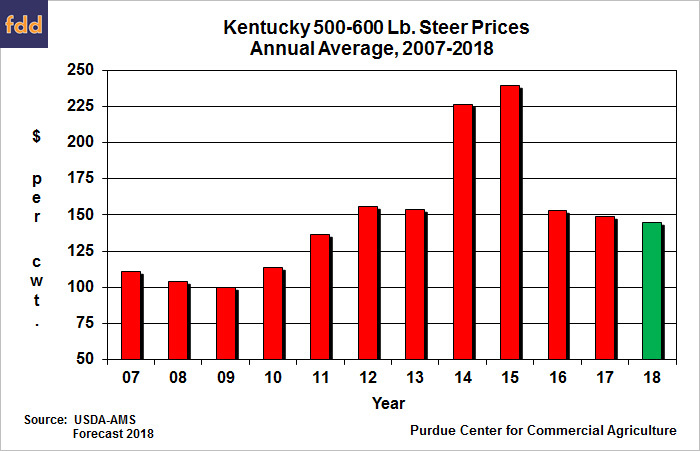 For example, recent weekly average prices for 500-600 pound Kentucky steer calves have been nearly $25 per cwt. above year ago levels. In 2017, the annual average price for a 5 to 6 cwt. Kentucky steer was about $149 per cwt. This year’s average is expected to be in the $142 to $148 range. Is It Time to Sell New Crop Soybeans?